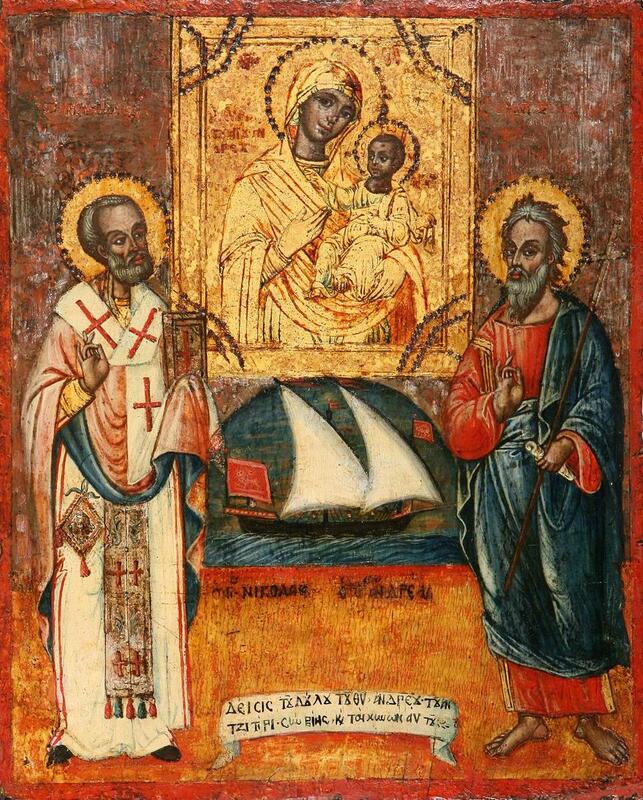 The hymns sung at the litia, the blessing of bread, wine and oil which is celebrated at Vespers on major feasts in the Byzantine Rite, for the feast of St Andrew the Apostle. The first-called among the disciples, and, as an imitator of Thy Passion, likened unto Thee, O Lord, Andrew the Apostle, with the hook of Thy Cross, drew up those who once had wandered in the depths of ignorance, and brought them to you. By his prayers, o Thou that are good above all, grant peace to our lives, and save our souls. 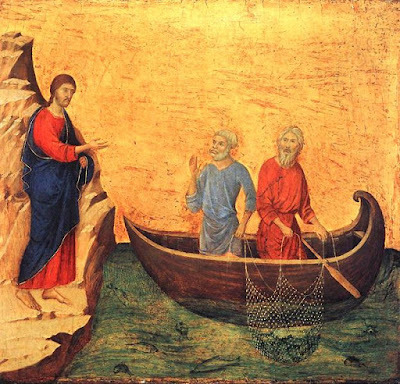 The Calling of Ss Peter and Andrew, one of the panels from the reverse of the large altarpiece of the Cathedral of Siena known as the Maestà, by Duccio di Buoninsegna, 1308-11. Let us sing, o ye faithful, of the brother of Peter, Andrew, the disciple of Christ; for once he once sought to catch fish by casting nets into the sea, but now, with the rod of the Cross, he casts his net over the world, and turns the nations back from error through Baptism; and standing before Christ, he asks for peace for the world, and great mercy for our souls. Having received within his heart the mystic flame that enlighteneth the mind and burneth away sins, the Apostle and disciple of Christ shineth forth with the mystical rays of his teachings in the unenlightened hearts of the nations, and likewise, burns the fables of the impious like twigs; for the fire of the Spirit hath such. O strange and fearful wonder! The tounge of clay, the body of mud, the nature of mud, the body of dust receiveth knowledge mystical and immaterial. But do thou, o teacher of matters ineffable, witness of things in heaven, intercede that our souls may be enlightened! Having seen the God for whom thou longed walking in the flesh upon the earth, o First-Called of His witnesses, thou didst shout with joy to thy brother: o Simon, we have found the One for whom we long! And to the Savior did Thou cry out like David: As the deer yearneth for streams of water, so doth my soul long for Thee, o Christ our God! Wherefore, adding love to love, by the Cross did Thou pass over to Him that thou loved, as a true disciple, becoming a wise imitator of Him through the suffering of thy Cross. Wherefore, since thou sharest now in His glory pray to him unceasingly for our souls. 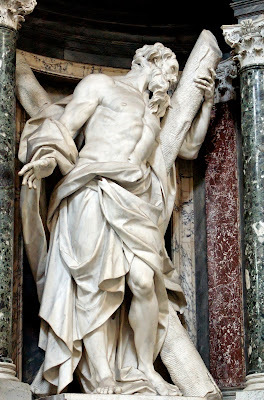 Let us acclaim Andrew, the herald of the Faith and servant of the Word; for he fishes men from the depths (of error), holding in his hands the Cross in place of a rod, and letting down its power like a fishing-line, draweth up souls from the errors of the enemy, and bringeth as a gift most welcome to God. O ye faithful, let us ever acclaim him ceaselessly sing to him with the choir of Christ’s disciples, that he may pray Him to be merciful to us on the day of judgment.